Biomechanics, the study of how the body moves, is one of the 21stcentury’s newest and most exciting scientific fields. To help commemorate National Biomechanics Day (NBD) in April—a worldwide celebration dedicated to exploring the potential for science and physical education—a group of Gordon students and faculty welcomed a bus of middle-school students from Lynn Public Schools to campus. 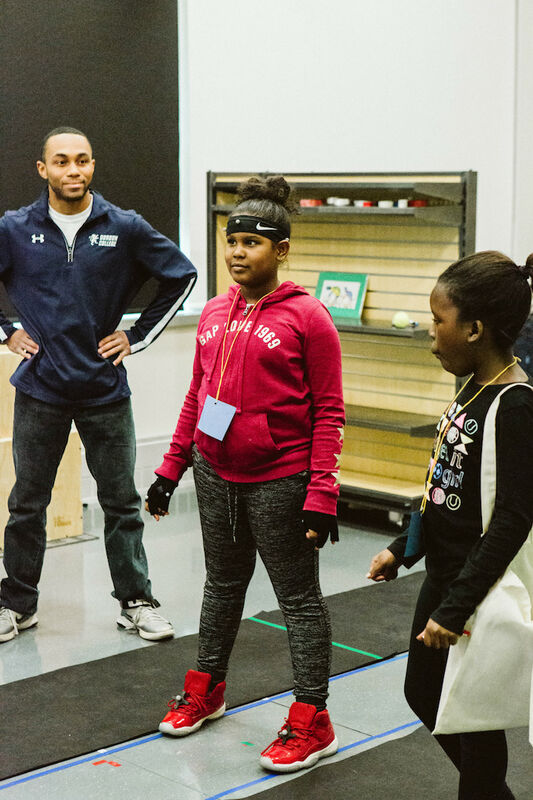 Dr. Jessica Ventura (kinesiology) constructed an experience that allowed young students to see first-hand how science is already a part of their everyday lives. Partnering with Greg Bish, director of service learning, and Carmen Ayerve Queen, who coordinates Gordon’s community tutoring efforts called College Bound, “one of the goals for the event was to show young students one career they can pursue through studying math and science,” said Ventura. To accomplish this, Ventura, Bish and Queen set up four learning stations in the Ken Olsen Science Center, each of which offered a glimpse into the field of biomechanics. For example, one station used motion capture technology to record the students’ motion and illustrate how they interact with the unseen force of gravity. As such, each of the different stations were managed by kinesiology students and College Bound tutors.